One of the bitter truths with which today’s world is forced to exist is the impure and distasteful environment we are living in. The fact that the human generation is going away from nature and the natural way of living has contributed to the increasing importance of Ayurveda in modern times. Get up to date with some of the most important and effective Ayurvedic theories to include in your life for a better living with Rishikul Ayurshala’s Ayurveda courses in Kerala. Go deeper into the science of Ayurveda while you interact with some of the most intelligent Ayurvedic minds in the Rishikul campus of Ayurvedic wisdom. Event Description: Rishikul Ayurshala conducts a number of Ayurveda courses in Kerala that are entirely focused on the traditional form of herbal and ayurvedic teachings. The programs offer you the opportunity to explore the science of Ayurveda in the most astonishing fashion. ● Get the basic knowledge of Ayurveda, including the historical significance of this holistic science. ● Get introduced to the real meaning of health and vitality according to Ayurveda. ● Understand the methods of preparing Ayurvedic medicines with various types of herbs. ● A detailed study of the body doshas and their roles in the wellbeing of the mind and body. ● Learn about the organic ingredients present in the body and the effects of each element individually. ● Master the art of cooking sattvic meals with our Ayurveda cooking courses in Kerala. ● Acquire skill in massaging a diseased body for making it healthy. ● Introduction to a wide range of herbs and learn how to make ayurvedic medicines. ● The science of detecting particular ailment and applying correct medicine. 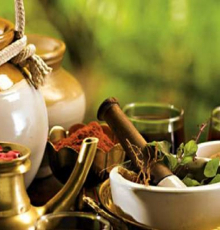 ● Classes for Panchakarma treatment - the core of all the ayurvedic therapies. ● Study the science of skin management with Ayurveda. Location: Prashanthi garden, Green beach resort, Kurakkanni, near helipad, North cliff, Thiruvananthapuram, Kerala. Trivandrum International Airport serves as the main airport to Kerala capital, Thiruvananthapuram. Buses and taxis are available from the airport to almost all parts of the city. The town is also connected to all major cities in India via road and rail network. We would be happy to pick you up from the Airport, Bus stand and Railway station on prior notice. About Rishikul Ayurshala: The Ayurveda wing of Rishikul Yogshala, Rishikul Ayurshala is a center of Ayurveda education in India. Thanks to a team of professional Ayurveda practitioners and their extraordinary ways of applying the Ayurvedic principles and medicines, the Ayurshala center is among the most trusted in the country. Located in the Ayurveda capital of the world, Kerala, Rishikul Ayurshala is home to some of the finest herbal therapy programs such as hair loss therapy, sinus treatment, blood purification treatment, etc. The Ayurveda center is known for carrying the vast legacy of spiritual and ayurvedic science with authentic standards of education and treatments in Kerala.